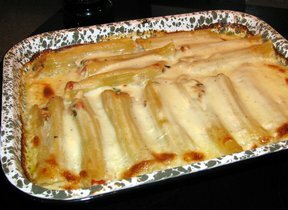 This recipe has a Mexican flavor and easy to make. It is great anytime and a definite kid-pleaser. Garnish with any of your usual taco toppings like sour cream, tomatoes, lettuce or olives. In a large skillet, brown beef and onion over medium heat until no longer pink; drain. Add cream cheese, salt and chili powder. simmer for 5 minutes. Meanwhile, bring a large pot of salted water to a boil. Add pasta and cook for 8 to 10 minutes or until al dente. Drain. 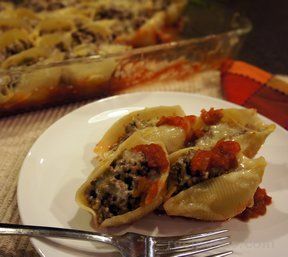 Fill shells with beef mixture and arrange in a 9x13 inch baking dish. 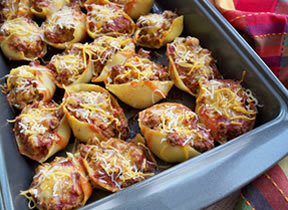 Pour taco sauce over shells. Top with cheese and crushed tortilla chips. Cover with foil and bake in preheated oven for 15 minutes. Uncover and cook for 15 minutes more.